With years of experience as a professional tower climber, Don Daso, K4ZA, leads you through designing and building your own antenna tower. You'll learn the skills, tools, climbing techniques, and safety measures necessary to improve your antenna system. 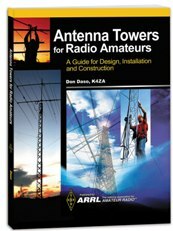 Antenna Towers for Radio Amateurs will guide you through the installation process in its entirety, from selecting a tower, digging the base, pouring concrete, and installing the tower, antenna and accessories. Included are tips for working with rope and pulleys, guy wires and associated hardware. You’ll also learn proper procedures for taking down existing towers, conducting inspections and performing maintenance. Whether you aspire to climb and work on an antenna tower yourself, or hire a professional, this is your guide to success! Antenna Towers for Radio Amateurs. Kindle Edition.